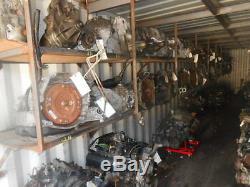 92 93 94 CARAVAN MANUAL TRANSMISSION 19465. 0 Miles (0 = not available or unknown). This part will fit these makes and models with these options LE BARON 93 M.
4-153 (2.5L) LE BARON 92 M. 4-153 (2.5L), w/o turbo DAYTONA 92 M.
4-153 (2.5L), w/o turbo SHADOW 92-94 M. 4 cyl SUNDANCE 92-94 M.
4 cyl CARAVAN 92-94 M. 4-153 (2.5L) VOYAGER 92-94 M.
Some images are standard stock images and not images of the actual part. Please verify part fitment before purchasing. It is very important as every car as many options and just because the part is of the same year make and model, it does not gauranty that it is the correct part. If there is any doubt, please send us a message with your VIN# included and we can let you know if the part is correct for your vehicle. Please message to verify cut locations on all weld on items. ONLY ITEM LISTED IS INCLUDED IN THE SALE. THERE MAY BE TIMES WHERE THERE ARE OTHER ITEMS ARE IN THE PICTURES. THIS IS ONLY BECAUSE THE PARTS HAVE NOT BEEN DISMANTELED YET. EXAMPLES OF THIS WOULD BE TIRES STILL ON WHEELS, HEATER CONTROLS WITH RADIOS, ETC.... OBVIOUSLY THESE ARE ONLY SOME EXAMPLES. PLEASE BE AWARE WHEN PURCHASING YOU WILL ONLY GET THE ITEM THAT IS LISTED IN THE DESCRIPTION AND NOT ALL ITEMS THAT ARE SHOWN IN THE PHOTOS. Used Engines are warrantied as a long block only. External parts are left on for convience. Parts must be switched as neccesary. Use of original wiring and sensors is required. Oil and coolant leaks are not covered. Install new seals as gaskets. Must change waterpump and timing belt. Use of OE approved Fluids and Lubricants are required.. Engine must be installed by a licenced Facility and an ASE certified or an OEM certified Technician. Follow OE procedures when installing unit. Flush cooler and lines or replace if required. AWD units must have the transfer case flushed and cleaned as well Install new filter, gaskets and seals. Use OE approved fluid only!!! Some units may need to have the computer reprogrammed by the dealer or go through a relearning period. Unit must be installed by a licensed Facility, ASE or OE Certified Technician. Transmission must be installed by a licensed Facility, ASE certified or OE certified Technician. Seals and gaskets must be replaced. Follow OE procedures for installation. Use only OE approved lubricants. Axle Assemblies and Transfer Cases. Drop out units are warrantied for 90 days against excessive bearing noise or play. Some bearing noise may be present. Units must be resealed and filled with OE approved fluid. Reconditioned units have had new seals and bearings installed. Reconditioned Units are warrantied for 6 months. Most Reconditioned units have been sealed and filled with fluid. Installer must double check and verify fluid level and top off as needed. All Used Cylinder Heads must be taken to a machine shop to be cleaned and planed. Valve Seals must be replaced. The 14 day period starts when you take possession of the part. Most areas in the US are within 5 days. It has high miles and/or light damage. A part that has not yet been graded. The item "92 93 94 CARAVAN MANUAL TRANSMISSION 19465" is in sale since Thursday, May 07, 2015. This item is in the category "eBay Motors\Parts & Accessories\Car & Truck Parts\Transmission & Drivetrain\Automatic Transmission & Parts\Complete Auto Transmissions". The seller is "dingsauto" and is located in Litchfield, Connecticut.